Brew of The Day: Glam Camp Accessory Haul and Bloggers Meetup! Hey dear coffeeholics! I just came from THE GLAM CAMP where you can get all the stuff every girl needs! I just dropped by there last night and I saw a lot of fashionable clothes, accessories, makeup, shoes, bags, and even beauty services for pampering. If you haven't dropped by then let me give you a tour first to tickle your senses and DROOL over the prices of some of the stuff I got! First of all, how to get there? I'm a commuter so of course I hopped on our favorite, inhumanly jam packed, and fast MRT train to Magallanes station. I then just walked to the other side of the "foot bridge" to get to the Ayalaland Tent Building. I then took the escalator to the 6th floor and VOILA! GLAM CAMP I'm here!!!! 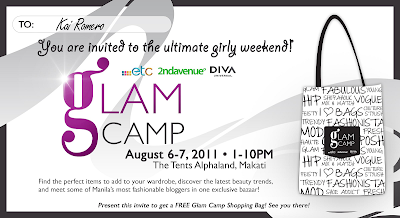 Invite to GLAM CAMP and claim ticket to my FREE bag! The first thing that you will see is the registration. I wasn't able to take pictures coz I was too excited to go in but they had a FREE photo booth outside! Yes there are a lot of freebies in store for you if you go there! But while I was there, I was able to claim my free GLAM CAMP bag thanks to Mitch! I won her bag contest and I'm super happy! I love the bag PLUS there were a few goodies inside so I was quite a happy gal as I walked in. Freebies = happiness yes? :) Ok the next posts will be photos of the place. I don't have a lot coz my battery was running low but I have enough for you to see some of the awesome stuff there. At the entrance you will see this!!! FREE MAKEOVER AND FAB PHOTO! Makeover station thanks to Skinwhite and Vitress!! FIRST STOP - Ana's booth care of Fashion Compass! DROP BY HER BOOTH, its at the very front near the stage, left side. KEY RING oh yeah! I LOVE THIS! I bought it from Ana for only Php150!!! Black and purple belt for only Php 20 each!!! I bought the black belt but she gave me the purple one for free! Purple Feather Earrings at Php 100. I did say I'd buy it the last time I on my feather earrings post eh! When I bought this, it didn't look as messed up as that. Next stop AVA's booth! Cookies and muffins and more! I bought a bag of star cookies and another one full of chocolate chip cookies all for Php 105 pesos! Ava wasn't there when I dropped by but Ava's mom was there! She gave me a 5 peso discount. hihi! Next stop, Mitch's booth! Me Time Manila Accessories! (you will find out what it is in a bit!) and so my haggard look. I posted this because to say thanks to her for my free GLAM CAMP bag! some accessories that she is selling. What I bought from Mitch! I availed of the Lay Bare Free Threading they offered there. I must confess, it was a bit painful hence the haggardness of my other pics. BTW, this was my 2nd time of having eyebrows threaded. Will probably discuss the pros and cons of it sometime soon. Another cool accessory shop! I'm sorry I forgot the name of the shop. Huhu. Will edit this later. Look at all those pretty feather earrings! And this is how you wear it! This is what I bought from their shop. Yay I now have a white one! Its only Php 80. And last purchase is these cereals! So affordable 2 boxes only Php 99! One other thing that I did that is not included in the photos here is that I had my nails done only Php100 and the polishes available were OPI and ORLY. I had my nails done in Lavender using OPI! I will be posting my NOTW soon. Also, a lot of our favorite fashion bloggers have booths there! Melai from Style and Soul, Danah & Stacey from Plump Pinay, and a whole lot more. So Coffeeholics, have you visited Glam Camp already? If you haven't, please do drop by GLAM CAMP today! They opened around 1 pm earlier and will close at 10 pm. Hope you have a glamorous weekend!